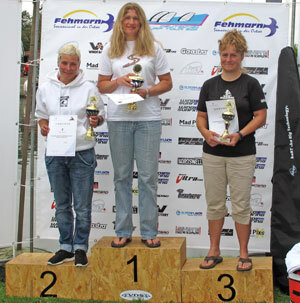 The 3rd event of the European Speedsailing Championship tour was held on the island of Fehmarn in Germany. It delivered some great, if challenging racing with winds up to 35 knots. Five rounds were completed by the international fleet and the men’s lead changed 3 times over the event. Anders Bjorkqvist from Sweden came out on top amazingly after a bad crash in the second round when he broke his finger and put his head through the sail! He carried on, taking the win by only one point over Manfred Merle from Germany who split the two storming Swedes, putting Daniel Borgelind in third. Zara won the women’s fleet with five bullets, beating her old rival Birgit Hofer, who consoled herself with taking the Germans ladies crown for 2011. 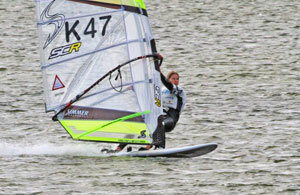 Zara’s speed was impressive all week underlined by the fact that she came an impressive 17th overall in a very strong men’s fleet of sixty plus entrants. This back to back win for Zara puts her on the top of the women’s European speed tour rankings with one event to go on home turf, Weymouth. She is hoping for a win here to secure her European Speed titlefor 2011. The men’s fleet is far from decided. Thorsten Mallon from Germany extended his lead over Patrick Van hoof from Belgium in the tour. But these two have now completed 3 events (only your best 3 results count) and the Swedes Anders Bjorkqvist and Daniel Borgelind are only 45 points behind the leader and have only completed 2 events. So a win in Weymouth will see the European title going to one of the Swedes, separated by only 1.8 points! We are looking forward to an epic battle going down to the wire.